Pierre-deschênes, Claudine. "Sept-Îles". The Canadian Encyclopedia, 23 June 2016, Historica Canada. https://www.thecanadianencyclopedia.ca/en/article/sept-iles. Accessed 24 April 2019. The first permanent European settlement dates from 1651: the Ange-Gardien mission founded by Father Jean de Quen. A trading and fishing post set up there in 1676 by Louis Jolliet was ceded in the 19th century to the Hudson's Bay Company. Sept-Îles, Qué, City, pop 25 514 (2006c), 25 392 (2001A), inc 1951. Sept-Îles, the metropolis of the North Shore region and centre of its mining industry, is located on the St Lawrence River, 230 km northeast of Baie-Comeau. It is one of Canada's most important seaports. The site, visited by Montagnais-Naskapi, was known to Basque fishermen before 1535, when Jacques Cartier named it - after the 7 islands that protect access to the bay. At the start of the 20th century, Sept-Îles had only 200 inhabitants, mostly Acadians by birth, living from fishing, plus 600 Montagnais-Naskapi on the reserve. In 1908 development of the pulp industry at Clarke City caused an influx of new workers. The exploitation of the mining resources of the hinterland, starting in the 1950s, led to rapid expansion of the city and activities related to the mineral and iron ore deposits of Nouvelle Québec and Labrador. Its port was improved in 1954 and 1970 to receive the massive cargo of ore brought down the Quebec, North Shore and Labrador Railway from Schefferville. 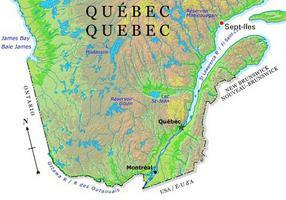 Sept-Îles has a mineral processing plant but its Iron Ore Company of Canada mine has been inactive since 1983. Since 1992, the Alouette aluminium smelter has been built by a consortium of 6 different companies; Aluminium Austria Metal Québec, Kobe Aluminium Canada, V.A.W. Aluminium Canada, Marubini Québec Inc., Hoogovens Aluminium Québec and Société générale de financement du Québec. The total cost of the smelter is estimated at $1.1 billion with a total capacity of 215 000 t a year, providing 600 permanent jobs. The Vieux-Poste, restored after archaeological digs, houses Sept-Îles museum.